*We reserve the right to substitute any item of equal value. Container shape and color may vary. Allergens: Prepared/packaged using machines that process dairy, soy, wheat/gluten, fish, eggs, nuts, tree nuts and peanuts. Contains fish, nuts, peanuts, milk, soy. Reknowned New York City chocolatier Jacques Torres has selected all the chocolate essentials for the truly ultimate S'mores party! Sit around the campfire or in the comfort of being indoors with the finest chocolate goodies to indulge, enjoy, and relax. This Gift Set Includes: Chocolate Covered Marshmallows, Dark Chocolate Graham Crackers, Classic Hot Chocolate, Chocolate Chip Cookies, Dangerously Dark Bar 72%, The Wicked Bar, and Milk Chocolate Bar. 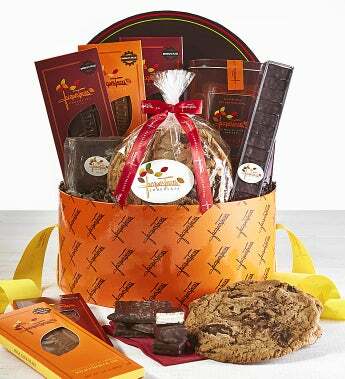 Beautifully packed in a signature round gift box with satin ribbons.